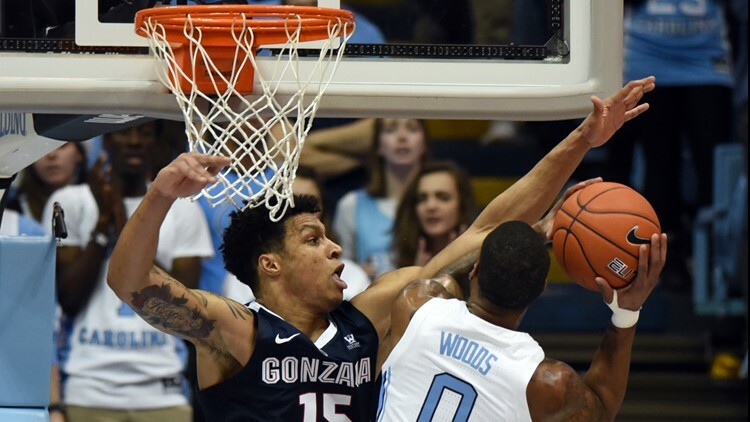 Fourth ranked Gonzaga loses to number 12 North Carolina on the road. CHAPEL HILL, N.C. (AP) - Cameron Johnson had 25 points and six 3-pointers while No. 12 North Carolina shot 55 percent to beat fourth-ranked Gonzaga 103-90 on Saturday night. Luke Maye added 20 points and 16 rebounds for the Tar Heels, who led by 14 at halftime and never let the Zags closer than eight after the break. The marquee nonconference game featured two of the nation's best offensive teams who lived up to those reputations, yet it was the Tar Heels' work on the boards that proved just as important. North Carolina (8-2) made 13 of 25 3-pointers to go along with a 42-21 rebounding advantage. That included 14 offensive boards that led to a 27-0 edge in second-chance points, which proved critical on a night when neither team missed too often. Zach Norvell Jr. scored 21 points to lead the Bulldogs (9-2), who shot 56 percent after halftime and 51 percent overall. Gonzaga: The Bulldogs sat at No. 1 in the AP Top 25 about a week ago, but they've lost two straight - though both games were serious nonconference tests that are sure to prepare the Zags for later in the season. They lost a close one last weekend against No. 3 Tennessee, then fell behind early Saturday night and never could catch up against a UNC offense that looked very comfortable on its home floor. UNC: The Tar Heels offered a reminder that they have the firepower to score with just about anybody. One significant concern, though, was they committed a season-high 23 turnovers that led to 29 points for Gonzaga - the kind of mistakes that could've proved very costly had North Carolina not been shooting so well and dominating the glass. Gonzaga: The Bulldogs return home to face Texas-Arlington on Tuesday. UNC: The Tar Heels play No. 19 Kentucky on Dec. 22 in the CBS Sports Classic in Chicago.